Thomasville is the county seat of Thomas County, Georgia, United States. The population was 19,340 at the 2013 United States Census, making it the second largest city in southwest Georgia after Albany. The city deems itself the "City of Roses" and holds an annual Rose Festival. The city features plantations open to the public, a historic downtown, a large farmer's market, and a 337-year-old oak tree at the corner of Monroe and Crawford streets. In 2016, Thomasville was featured as the second-best historic small town in USA Today on one of the paper's 10 Best Lists, runner up to Bisbee, Arizona—coming in ahead of Abingdon, Virginia, Mackinac Island, and Astoria, Oregon. Thomasville was founded in 1825 as seat of the newly formed Thomas County. It was incorporated as a town in 1831 and as a city in 1889. The community was named for Jett Thomas, a general in the War of 1812. Thomasville plants and maintains more than 1,000 roses located throughout the city, as do a number of residents who have their own rose gardens. During the last week of April, rose growers from all over the world display their prize roses for a panel of judges. The Thomasville Rose Garden at Cherokee Lake Park is the largest of 85 rose beds maintained by the city, and is host to the annual rose festival. Thomasville is home to several historic and cultural organizations, including the Thomas County Historical Society and Museum of History, Thomasville Landmarks, Inc. the Thomasville Center for the Arts, Jack Hadley's Black History Museum, and Pebble Hill Plantation. Daily tours and research hours are available at each institution. Thomasville is located at 30°50′11″N 83°58′42″W﻿ / ﻿30.83639°N 83.97833°W﻿ / 30.83639; -83.97833 (30.836444, -83.978199). According to the United States Census Bureau, the city has a total area of 14.9 square miles (39 km2), of which 14.9 square miles (39 km2) is land and 0.1 square miles (0.26 km2) (0.40%) is water. It is the second largest city in Southwest Georgia after Albany. The city has three U.S. Routes: 19, 84 and 319. It is located 34 miles northeast of Tallahassee, Florida, 28 miles southwest of Moultrie, 43 miles west of Valdosta, 95 miles east of Dothan, Alabama, 59 miles south of Albany and 22 miles north of Monticello, Florida. As of the census of 2000, there were 18,162 people, 7,021 households, and 4,654 families residing in the city. The population density was 1,221.4 people per square mile (471.6/km²). There were 7,788 housing units at an average density of 523.7 per square mile (202.2/km²). The racial makeup of the city was 55.39% African American, 42.83% White, 0.23% Native American, 0.53% Asian, 0.01% Pacific Islander, 0.24% from other races, and 0.78% from two or more races. Hispanic or Latino of any race were 1.28% of the population. There were 7,021 households out of which 30.8% had children under the age of 18 living with them, 39.7% were married couples living together, 22.7% had a female householder with no husband present, and 33.7% were non-families. 29.7% of all households were made up of individuals and 12.7% had someone living alone who was 65 years of age or older. The average household size was 2.47 and the average family size was 3.06. In the city, the population was spread out with 26.9% under the age of 18, 8.7% from 18 to 24, 26.8% from 25 to 44, 21.5% from 45 to 64, and 16.2% who were 65 years of age or older. The median age was 36 years. For every 100 females, there were 83.3 males. For every 100 females age 18 and over, there were 78.0 males. The median income for a household in the city was $29,926, and the median income for a family was $37,606. Males had a median income of $28,331 versus 12,312 for females. The per capita income for the city was $15,910. About 15.1% of families and 19.0% of the population were below the poverty line, including 25.1% of those under age 18 and 21.0% of those age 65 or over. The Thomasville City School District holds pre-school to grade twelve, and consists of three elementary schools, a middle school, and a high school. The district has 204 full-time teachers and over 3,107 students. The Thomas County School District holds pre-school to grade twelve, and consists of three elementary schools, a middle school, and two high schools, Thomas County Central and Bishop Hall Charter School. The district has 329 full-time teachers and over 5,466 students. Brookwood School (Pre-K-12) Independent college preparatory school. The bakery company Flowers Foods is based in Thomasville. Senior Life Insurance Company is based in Thomasville. The city has installed a fiber optic network, known as CNS, which provides affordable, high speed Internet access. The city's network has been in place since 1999. The city transfers excess revenues from CNS services and from its other utilities to the city's general fund to pay for police and fire protection, street maintenance, and other essential services. In 2012, because of these revenues, the city was able to eliminate property fire tax for its residents and businesses. The Thomasville Times-Enterprise is a daily newspaper owned by Community Newspaper Holdings, CNHI. The newspaper publishes the glossy magazine Thomasville Scene. ^ "Thomasville (city) QuickFacts from the US Census Bureau". Quickfacts.census.gov. Archived from the original on 2012-12-22. Retrieved 2012-12-22. ^ Hellmann, Paul T. (May 13, 2013). Historical Gazetteer of the United States. Routledge. p. 249. Retrieved 30 November 2013. ^ Lotz, CJ (21 April 2016). "The South's Rose City Throws a Party". Retrieved 22 May 2016. ^ "Thomasville Landmarks". Thomasville Landmarks. Retrieved 11 July 2018. ^ "Thomasville, Georgia Travel Weather Averages (Weatherbase)". Weatherbase. Retrieved 11 July 2018. ^ "Climate Statistics for Thomasville, Georgia". Retrieved May 23, 2012. ^ "School data for Thomasville City". School-stats. Retrieved 5 September 2010. ^ "School data for Thomas County". School-stats. Retrieved 5 September 2010. ^ "Thomas University". Retrieved 5 September 2010. ^ "Southwest Georgia Technical College". Archived from the original on 6 August 2010. Retrieved 5 September 2010. ^ Dozier, Patti. "City fire tax extinguished". Timenterprise.com. Retrieved 11 July 2018. ^ "William L. Andrews". databaseFootball.com. Retrieved December 21, 2012. ^ Block, Gordon (2016-04-05). "As Gen. Lloyd Austin retires, north country remembers his Fort Drum command". Watertown Daily Times. Archived from the original on 2018-03-27. ^ "MIKE BOBO". tvillebulldogs.com. Retrieved February 13, 2015. ^ Simmonds, Jeremy (2012). "Elbridge 'Al' Bryant". The Encyclopedia of Dead Rock Stars: Heroin, Handguns, and Ham Sandwiches (2nd ed.). Chicago: Chicago Review Press. p. 82. ISBN 978-1-61374-478-9. ^ "Joe Frank Burns". DatabaseFootball.com. Retrieved December 21, 2012. ^ "BUTTERWORTH, Benjamin, (1837 - 1898)". Biographical Directory of the United States Congress. Retrieved December 21, 2012. ^ "As Kentucky-based 'Justified' comes to an end, actress reflects on her character, Ava, and what's next". Kentucky.com. Retrieved 11 July 2018. ^ Fischer, Jake (2016-06-16). "The twists, turns of Robert Carter's long NBA draft road". Sports Illustrated. Archived from the original on 2018-03-27. ^ "Danny Lamar Copeland". databaseFootball.com. Archived from the original on October 15, 2012. Retrieved December 21, 2012. ^ Watt, Will (2016-04-14). "The Life of Mary Lena Faulk". Thomasville Times-Enterprise. Retrieved 2018-03-27. ^ "Myron Guyton". databaseFootball.com. Archived from the original on July 17, 2012. Retrieved December 21, 2012. 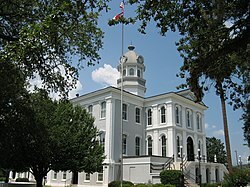 Wikimedia Commons has media related to Thomasville, Georgia.